1:10pm ET: Jeff Passan says there is “no deal” and this is a “false rumor.” Maybe the Pirates leaked the rumor to try to get Brian Cashman to panic include Gleyber in a trade package? That’d be kinda funny. 12:09pm ET: Looks like we can cross one pitching trade target off the Yankees’ list. 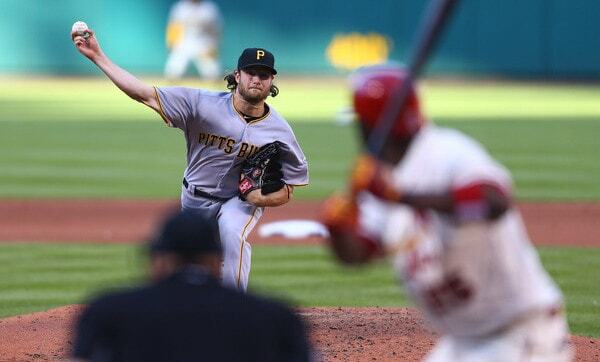 According to Jon Morosi and Ken Rosenthal, the Astros and Pirates are close to a trade sending Gerrit Cole to Houston. There’s no word on the return yet, though I imagine it’ll be a package of prospects. Here is MLB.com’s top 30 Astros prospects list, if you want to skim that. The Yankees have been connected to Cole for weeks, and at one point it seemed the two sides were inching closer to a trade. That didn’t happen, obviously. The Yankees tried to build a trade package around Clint Frazier, but the Pirates reportedly insisted on Gleyber Torres, which was a sticking point. As I said a few weeks ago, I wasn’t super hot on Cole as a trade target. He’s obviously talented, but he’s been trending in the wrong direction the last two years, and I’ve grown tired of the “better stuff than results” profile. If the Yankees are going to trade a big prospect package, I’d prefer someone they don’t have to fix, you know? In addition to Cole, the Yankees have also been connected to other young-ish starters like Michael Fulmer, Chris Archer, and Patrick Corbin this offseason. They even made offers for Fulmer and Archer at some point. I don’t think it was Cole or bust. They’re going to keep looking for another starter. That’s what they do. The Yankees have five starters (Luis Severino, Masahiro Tanaka, Sonny Gray, CC Sabathia, Jordan Montgomery) for five rotation spots at the moment, so they’re not desperate for a starter. They figure to sit back and see if anything falls into their laps before Spring Training.